Halloween is my least favorite holiday. I think it’s great for little kids, and when I was little I loved trick-or-treating in elaborate costumes my mother sewed or invented with stuff around the house. But by middle school I was kind of over it. I did have one fun year in college when my dorm floor went all out decorating our hallway for Halloween. But then a very long dry spell. This is my first Halloween in a house, so I’ve never really gotten many trick-or-treaters as a lifetime apartment dweller. I think we’ll get a proper number of them this year, though, so I feel like I should make the front porch look festive. I’m looking forward to seeing kids in their costumes at home and at school. I also have this huge library to decorate, so I need to put up some things there, too. I’m trying hard to get into the spirit of things and not be a Halloween Grinch, but I have zero ideas when it comes to this particular holiday. I’ve been trolling Martha Stewart’s site for ideas, and I have found a few that don’t involve excessive blood, sweat, and tears. 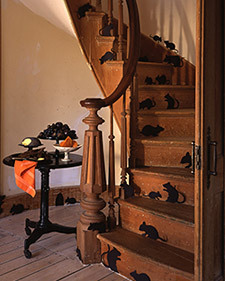 I’m going to make these mice for my library and put them around the baseboards. And this weekend I’m going pumpkin picking with Maggie. I don’t know if I’ll carve the pumpkins, I may just make a fall display outside to go with the plant my mother bought me (I think it’s a mum). Maybe I’ll get really into it and get some hay and gourds. Who doesn’t love a gourd in October? My real fear is dressing up for Halloween. My school asks all the kids and staff to dress up as book characters and bring the book. I’m still not clear on whether the staff is expected to dress up, or if it’s optional. If I need to dress up, I am truly at a loss. The thing that stands out the most from when I fell out of love with Halloween was dressing up. I always thought costumes smelled funny and were uncomfortable, plus I’m allergic to pretty much everything on Earth and feel like I spent all those Halloweens just being itchy. And I was a theater geek for years, so I have no idea why I didn’t mind dressing up for that but came to loathe it for Halloween. I did eventually give up my thespian dreams, so maybe the weird smell and itchy factor is to blame. I know that sounds incredibly prissy, and I am just a bundle of fun for Halloween, right? I’m working on it now that I’ll get real trick-or-treaters and work in an elementary school. Maybe I’ll even like it, once I get over the panic of what exactly to do.